Bishop W. Y. Chen, Board of Missions of the Methodist Church , “Mission Photograph Album – Portraits #06 Page 021,” UMC Digital Galleries, accessed November 8, 2017, http://catalog.gcah.org/omeka/items/show/60345. Chen, Wen-Yuan (1897-1968), bishop of the Methodist Episcopal Church in China. Chen was educated in Methodist schools in Fuzhou (Foochow), earned B.A. and M.A. 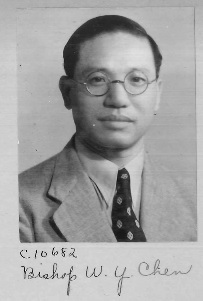 degrees at Syracuse University, New York, and returned to serve as pastor of the Church of Heavenly Peace (Tianantang) in Fuzhou. He received his Ph.D. degree from Duke University in 1929 and returned to Fujian (Fukien) Christian University in Fuzhou, where he taught psychology and later became dean and acting president. In 1936, while serving in Shanghai as head of the national YMCA’s Youth and Religion department, he was elected general secretary of the National Christian Council. He was elected a delegate to the International Missionary Council at Madras in 1938 and served as a vice-chairman. In 1941 he became one of the four Methodist bishops in China, serving the west China area. As late as 1946 he continued in active service to the National Christian Council, as honorary general secretary; attending its first postwar meeting in December of that year. Once designated by Time magazine as “China’s No. 1 Protestant,” Chen became an early target of the anti-imperialism movement in the Chinese church. At a denunciation meeting in 1951 in Beijing (Peking) attended by 151 Protestants, he was one of four Chinese church leaders attacked. In a speech entitled, “I Denounce That Christian Reprobate W. Y. Chen,” his fellow Methodist, Jiang Changchuan (Z. T. Kaung), charged him with supporting the Nationalist regime of Chiang Kai-shek, both at home and abroad. He was placed in detention in 1951 and was released in 1959 due to illness. He died of cancer. Roderick Scott, Fukien Christian University (1954).